Full Speed programmable keyboard interface connects to your computer’s USB port. Uses standard drivers - No special drivers required. All 36 individual inputs can be active simultaneously. 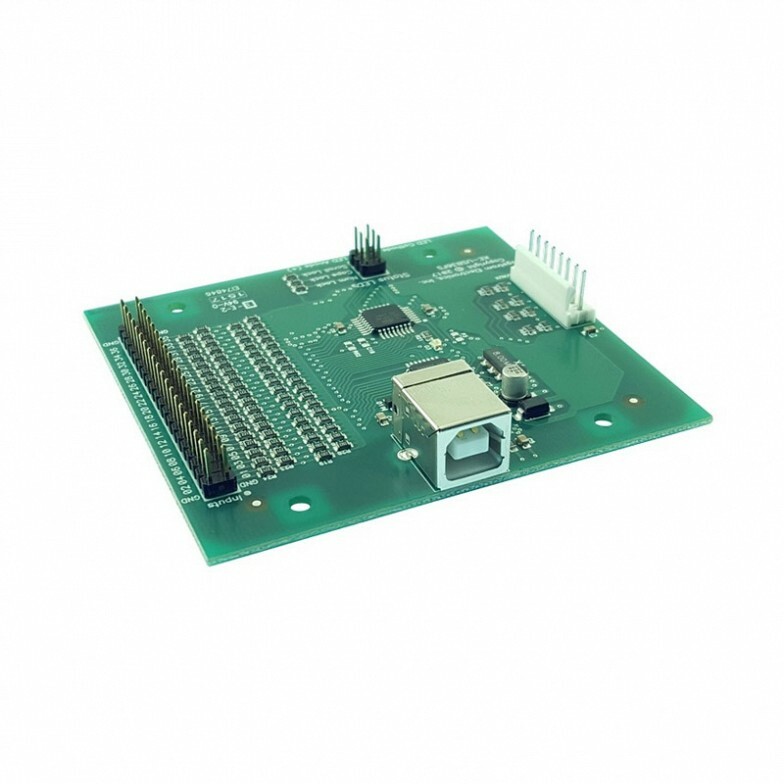 An 8-postion auxiliary header allows for the connection of a Trackball or Spinner, or our Relay-8 board and/or our Rotary-5 board. All power for the KE-USB36FS is taken directly from the computer’s USB port, no additional voltage supply is needed. Multiple KE-USB36FS units may be connected to the same computer. The programming application provided allows up to four simultaneously attached units to be configured individually. Supplied with a printed user manual and disk containing computer applications which are used to configure the KE-USB36FS. A Full Speed USB interface with 36 individual inputs and an auxiliary port for trackballs, spinners, or expansion boards! The KE-USB36FS Keyboard Encoder interfaces 36 switches or other input devices to the computer's USB port to generate keystrokes or mouse button actions. This Full Speed USB interface provides ultra-fast responses to inputs and allows any or all 36 inputs to be active simultaneously. The KE-USB36FS is programmed via the USB port of the computer through a standard USB A-B male/male cable. 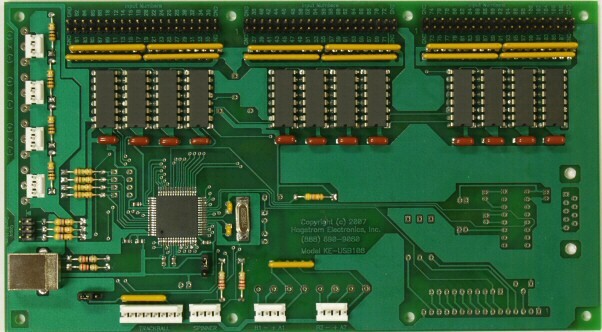 The input pins of the unit’s interface header can be programmed to emulate any key from a standard keyboard as well as mouse buttons when activated. Keystrokes sent in response to an input may also be modified with a Shift, Alt, or Ctrl function (Example: Ctrl+F1). 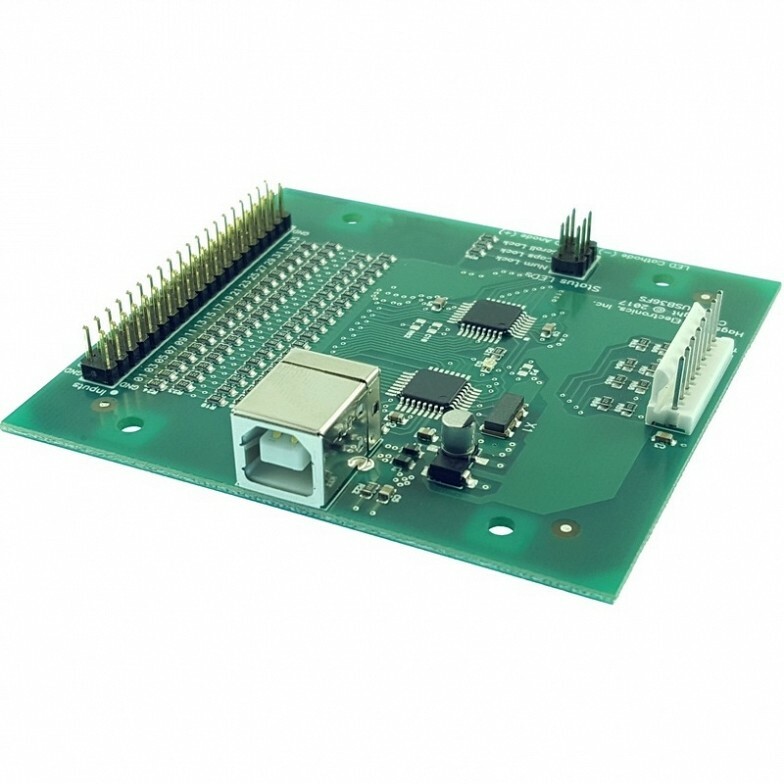 Once programmed, the configuration is stored on the KE-USB36FS in non-volatile memory. A printed manual and disk containing application programs are provided for the user to configure the KE-USB36FS features. 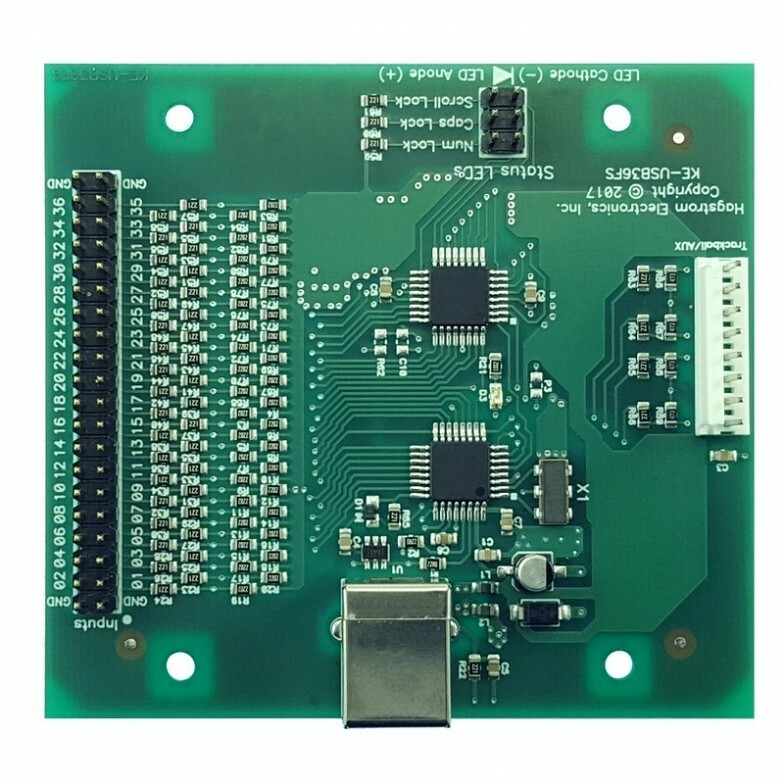 The programming application is a user-friendly point and click interface which allows the operator to quickly set up the KE-USB36FS for a particular application. The KE-USB36FS has a total of 36 individual inputs which are activated by shorting to the provided logic ground. Any standard keystroke can be emulated for an input activation. In addition to generating keystrokes, the KE-USB36FS inputs can be programmed to emulate Left, Middle, and Right Mouse Buttons. Use pushbutton switches, toggle switches, or anything that creates a contact closure on the inputs. Logic outputs may drive the inputs of the KE-USB36FS provided they are active low and do not supply current into the input. The KE-USB36FS features a 2x3 header for connection to status LEDs for Num, Caps, and Scroll Lock indicators. Current limiting is provided on the unit, allowing LEDs to be connected directly to the header’s pins. Connection to this LED header is not required, but the status feedback is useful for many applications. An 8-position auxiliary header is also available to perform one of several programmable modes of operation. Trackball mode converts quadrature signals from a Trackball or Spinner into mouse movement. 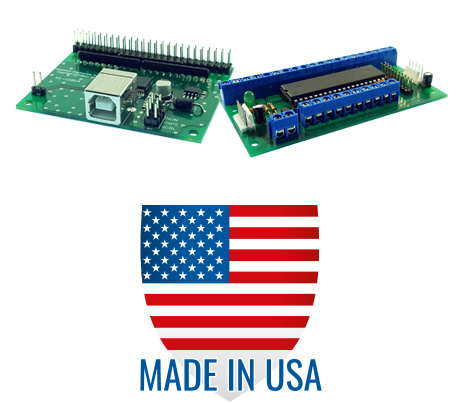 Relay-8 and Rotary-5 mode may be used to attach our Relay-8 unit, providing eight relay outputs, and/or our Rotary-5 unit to provide 5 individual rotary encoder inputs in addition to the KE-USB35FS unit’s own 36 individual inputs. Any of various manufacturer’s trackballs or spinners may be used with the KE-USB36FS to produce mouse cursor movement in the X and Y directions. 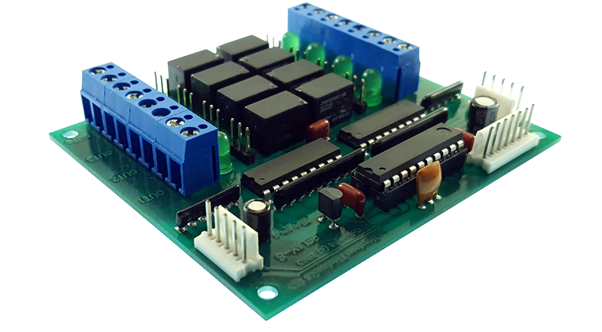 When using the Relay-8 option, examples are provided for users to implement their own program to control the output states of the eight relays on our Relay-8 unit connected to the auxiliary port. 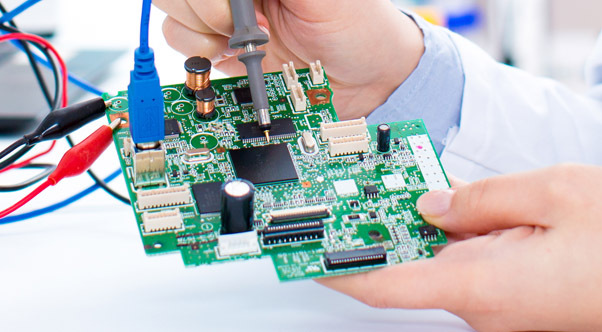 Rotary-5 mode is used when one of our Rotary-5 devices is attached to the auxiliary header. 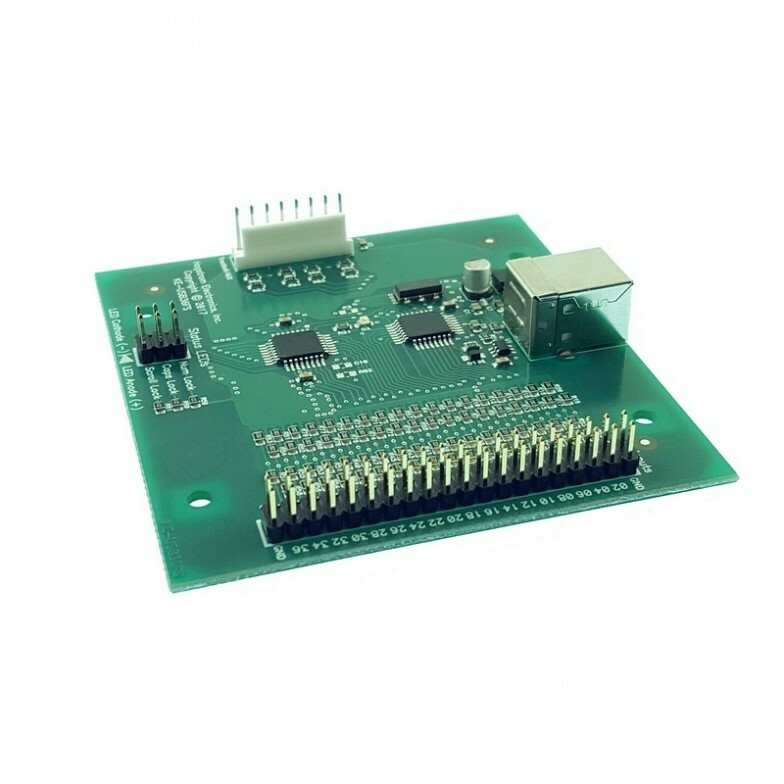 This option provides 5 channels of rotary encoder input. Keystrokes may be programmed for both directions of movement for each of the 5 rotary encoders in addition to the 36 individual inputs on the KE-USB36FS. Multiple KE-USB36FS units may be used on one computer system. The programming application provided allows up to four simultaneously attached units to be configured individually. All power for the KE-USB36FS is taken directly from the computer’s USB port, no other voltage supply is needed. Because the KE-USB36FS emulates a standard USB keyboard and mouse, no special drivers are required. Any computer that supports a standard USB keyboard and mouse may be used with the KE-USB36FS unit. The KE-USB36FS will work as the only keyboard on your computer or in addition with other USB keyboards, PS/2 keyboards, or other keyboard and mouse devices also attached to the system. KE-USBMM6 - USB A-B male/male connecting cable. Length = 6 feet. 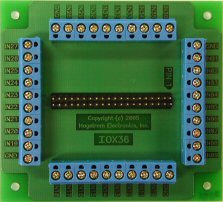 IOX36 - Breakout Board plugs onto the KE-USB36FS input header and provides a screw terminal for each of the 36 inputs. Includes 18-inch ribbon cable for connection to the input header. MTA100-8/5-36FF – KE-USB36FS encoder to Relay-8/Rotary-5 connecting cable. Length = 3 feet.